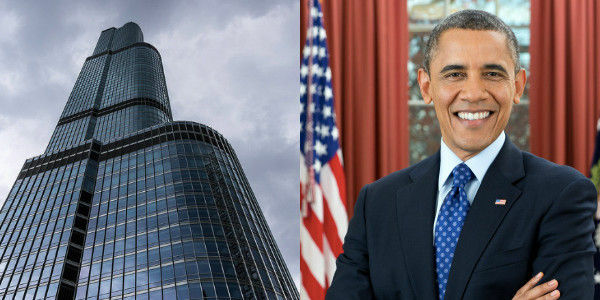 petizione: Let's Rename the Street Trump Tower Is on to "Obama Way"
Let's Rename the Street Trump Tower Is on to "Obama Way"
I love living in Chicago. I don't love going downtown and being forced to look at the massive Trump Tower knowing that its namesake is one of the worst people alive. I know I'm not the only Chicagoan who feels this way because crossing the bridge nearby displays dozens of people taking photos of themselves flipping the building off. That's why I want the city of Chicago to rename the street where the tower is located to "Obama Way." Please sign on if you'd like to change Wabash Ave to honorary "Obama Way" so that Trump Tower lives on "Obama Way." Barack Obama is one of the best things to come out of Chicago in a long time. It's truly a blemish on our downtown to have a massive Trump building. I think changing the street name would send the message to Trump and any of our visitors that we are an Obama city, not a Trump city. He may own Trump Tower, but we own Chicago. Chicago has dozens of honorary street names. Everything from Hugh Hefner to Saint Mother Theresa and various other veteran's streets. Obama makes so much sense as the next and putting it on Wabash Ave. would just be perfect. Please sign my petition to the city of Chicago to get "Obama Way" as the new name of the street on which Trump Tower is located!